Conklin's Fabric Reinforced Roofing System by Commercial Roofing of Tulsa, OK is a tough and flexible system that is recommended for both new and existing roofs. This extra durable system stops leaks with top of the line waterproofing and offers excellent wind and hail protection as well. The Fabric Reinforced system increases energy efficiency and lowers utility expenses with its cool, white reflective surface. 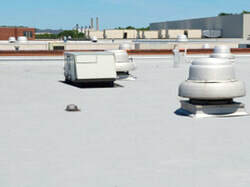 This rugged roof system can extend the life of your existing Tulsa Business roof and will lower energy costs. And of course you can enjoy peace of mind with Conklin's warranty program, including a non-pro-rated material warranty. The smartest way for your Tulsa Business to stay in the black, is with a white Conklin roof from Commercial Roofing of Tulsa, OK. The average Tulsa, OK roof absorbs a great portion of the suns UV rays as heat. This heat causes buildings to warm, using more energy to keep cool, specifically in the warmer months. With our white Single-ply Roofing System, you can reflect 84% of the suns heat, which in turn will cool your roof saving you substantial amounts on your commercial energy bill. Clients have shown that you could save as much as 30% on your cooling bill! Because of this large amount of savings, past customers have noticed that installing this Roofing System was a great return on investment. Building owners discovered that the roof paid for itself simply in lower air conditioning costs. It is also possible that federal tax rebates, tax credits, and deductions could offset the cost. Your utility company and tax adviser will have more details. Years from now after wind and hail, storms and earthquakes, any roof would need to be repaired or replaced. With the superior quality of Conklins Roofing Systems, as simple recoat will do the trick in most cases. In fact, multiple recoats can be done for as long as you own your Tulsa building - saving you the expense of a new roof. Leak free protection and exceptional energy savings is what you can expect from Commercial Roofing of Tulsa, OK's Fabric Reinforced Roofing System by Conklin. They maintain maximum reflectivity and energy savings because their surfaces are dirt resistant and resistant to recoloration. Annual or bi-annual cleaning is all that is needed to keep them white. Feel free to talk in more detail about Conklin's Fabric Reinforced Roofing Systems for your Tulsa Commercial Roof. We would be pleased to share with you experiences from many local businesses as well as detail the process and expense. We will provide you with a Free Estimate of any services you're interested in. Call us today at (918) 992-2020 or send us an email using the form located on this page.